« Is HP hiding cloud software in its labs? Microsoft Management Summit 2011 has a theme this year. Naturally it is cloud computing. The premise is that advanced systems management tools for Hyper-V and Windows Server will lead all down the primrose path into private clouds and your data centers, once sprinkled with enough powdered unicorn horn, will turn into Amazon Web Services on steroids or something. Brad Anderson VP of management and security at Microsoft will have a lovely song and dance routine at the keynote around this. It’ll be a work of art, but the message train went straight off the rails when they brought up big-box department store Target (that’s Tar-JHAY to you) as the big win for System Center, which is Microsoft’s answer to VMware vCloud Director and every other virtualization/automation/cloud platform out there. But they couldn’t have picked a worse example. Target has implemented System Center and Hyper-V in its retail stores and collapsed 8 real servers down to two per location, a whopping 75% reduction in footprint. That’s the story. Bravo. Saves on power, maintenance, refresh cycle, blah blah. But this is not a cloud story, not even a little bit. This is the anti-cloud story. Microsoft couldn’t have picked a better example of what the difference between leveraging virtualization and cloud computing actually is than this. All Target did was do everything they’re already doing, but better. They didn’t revamp their infrastructure, they just optimized what they already had. What is cloud about that? I’m a skeptic, I’ll bash anyone on either side of the aisle in the private cloud/public cloud debates, but this is egregiously misleading. 1) Done away with all the on-prem servers in favor of a WAN optimizer or three and served up infrastructure and/or services remotely to every store from a central Target-run data center. 2) Found a way to utilize all that spare capacity (did they really just chuck three out of every four servers around the nation? Mental note: check Target dumpsters for salvage) to serve back office and online services needs. 4) Bought an Oracle Exalogic for each of Target’s 1,755 locations to make sure they were getting “enterprise grade cloud” from Uncle Larry. Ok that one was a joke. But that would be HARD, you see. Any of those options, which would qualify as legit exercises in cloud computing, would require a hell of a lot more work than simply trimming infrastructure. They redecorate the bathrooms every once in a while too, and they aren’t touting “next-gen on-demand potty usability”, are they? Really revamping how Target did IT operations to actually gain some benefit from the promise of cloud computing would requires years or planning and re-architecting and would turn the entire IT organization on its head. What this use case demonstrates isn’t even a step on the path to cloud computing. It’s a step sideways into the bushes or something. This is what you do WHILE you try and come up with a plan to utilize cloud techniques and services. When and if Target moves to take steps to actually do cloud computing at its stores, everything Microsoft touted today is not even going to be irrelevant- it’s going to be invisible. Systems management won’t even be part of the conversation. Cloud is about services, not systems. To top it off, the grand irony in this is that Target was a big early customer win for AWS too; it famously defended its retail site from getting overrun on “Cyber Monday” and proved out the concept of elastic scale very nicely. There’s a clear juxtaposition here: public cloud is far enough along that Target uses it for actually doing business. Microsoft’s version of private cloud…isn’t. UPDATE: This blog has been edited to reflect that Andersen’s keynote has not happened as of writing. When it does go off tomorrow, we will be very pleased to accept criticism of our out-in-front opinion on it. UPDATE: This blog post has come under some criticism for misrepresenting how Microsoft is presenting their Target Case Study. It has been pointed out that in the language used in Microsoft’s Case Study doesn’t use the word cloud, and during the video presentation during Andersen’s keynote, cloud was not specifically part of the Target presentation, i.e. no one has actually said “Target is doing cloud computing here” and it is therefore not within the pale to make fun of them for such such an out of tune sales pitch. This is unmitigated BS. Despite a technically accurate description of what Target achieved as a beta tester of Hyper-V and SCOM, it was thrown up in everybody’s face unabashed as a big part of Microsoft’s campaign to position itself as part of the cloud computing market. “Particularly as organizations are contemplating cloud computing, they find comfort in knowing the Microsoft platform can virtualize and manage all kinds of applications — Microsoft’s, a third party’s or home-grown — on a massive scale.”– said Brad Anderson, corporate vice president, Management and Security Division at Microsoft. 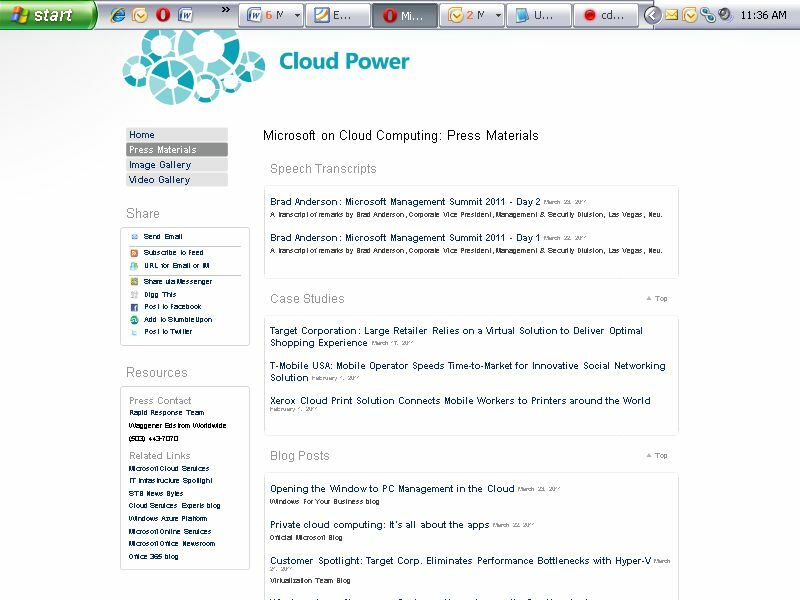 Target is front and center on the Microsoft Cloud Case Studies page (screenshot if the page has changed). 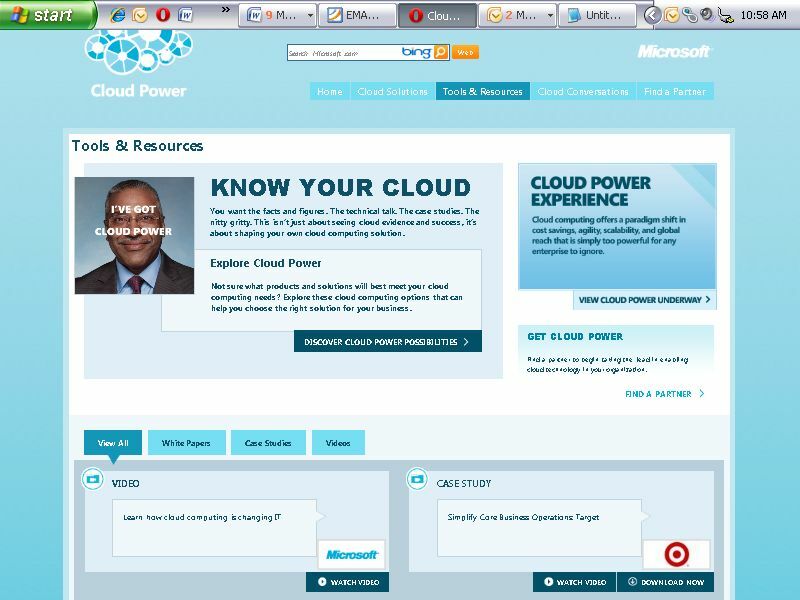 Target is top of the list for a Microsoft press kit on cloud computing (screenshot if the page has changed). The description of Brad Andersen’s Day One MMS 2011 keynote address which featured the Target case study. Target isn’t doing cloud computing here. If you’re trying to sell hamburgers, don’t show up holding a hot dog. We all have a rough idea of what cloud computing is by now; deliberately screwing with that idea for the sake of a marketing campaign is just dumb. The whole cloud computing agenda in today's marketplace is a very interesting topic for discussion because it seems like there is still a pretty solid split on how people feel about the migration. The toss up between cost and security is a very thin line.